Ahead of its July debut on SBS On Demand, The Handmaid's Tale has been renewed for a second season. It's official - The Handmaid's Tale has been renewed for a second season. The announcement was made overnight in New York at Hulu's Newfronts presentation to advertisers just two weeks after the series debut in the US. In Australia we'll get our first look at the show when the full first season debuts exclusively on 6 July to stream on SBS On Demand. Critics have universally loved the series, with many of them remarking on just how prescient the series seems. "Watching the news today doesn’t necessarily create the impression that a real Gilead will arise within the next six months, but it feels far more possible than it should, and that makes The Handmaid’s Tale feel like even more of a Molotov cocktail being hurled at a too-complacent society than anyone could have intended when they started making this riveting new drama." "The Handmaid’s Tale is a sobering reminder to hold ourselves accountable for the state of the world, when and if we can." "Regretfully, the 30-plus-year-old work has become a story for the very time and place we're living in; this is probably the spring's best new show and certainly its most important." 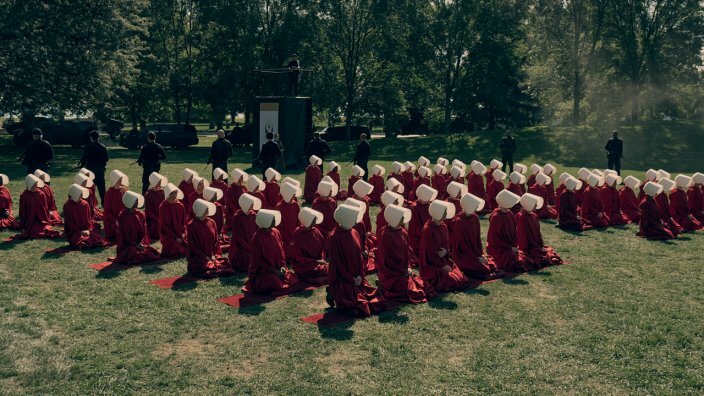 Proving just how culturally resonant the show has become in just two weeks of airing, on Tuesday in the US at a Planned Parenthood event, former Presidential hopeful Hilary Clinton evoked The Handmaid's Tale in a speech she delivered. "I am not suggesting this dystopian future is around the corner, but this show has prompted important conversations about women’s rights and autonomy,” Clinton said. The Handmaid’s Tale is available to stream at SBS On Demand. The highly anticipated adaptation of Margaret Atwood’s award-winning novel The Handmaid’s Tale makes its Australian premiere exclusively on SBS On Demand, with the full series available to stream from Thursday, 6 July. Noah Hawley’s third visit to the Coen Brothers-inspired universe is getting rave reviews. 'Fargo' series creator Noah Hawley has gone and done it again - attracting a stellar cast for round three. 'The Young Pope' kangaroo - the ultimate 'Who is that guy'?